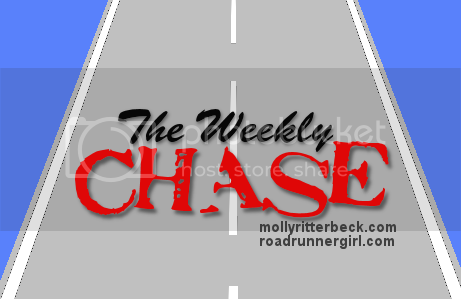 Road Runner Girl: The Weekly Chase #4! It's time for another Weekly Chase!!! I have loved reading all about your goals on your blogs! If you haven't already please join us and link up your posts so we can all encourage one another on our goals this week! Once again we are focusing on Molly's challenge this month to make ourselves a priority. I am loving this challenge since I never make enough time for myself. Goal #1: Read a book at least 15 minutes each day (challenge goal). I did this about 50% of the week. Goal #2: Schedule the massage my hubby bought for me on Valentine's Day (challenge goal). FAIL! Ugh! I totally forgot to do this. I got calls to sub 3 days last week and had a hard time getting things done. Goal #3: Recover. Yep! This one was easy since all I had to do was rest from running. I had wanted to get to the gym and ride the bike some but it didn't happen due to work (which I'm super thankful for!). Goal #1: Read a book at least 15 minutes each day (challenge goal). I WILL succeed at this one this week!!! Goal #2: Schedule the massage (challenge goal). I soooo need this! Goal #3: Get my hair cut (challenge goal). It has been forever since I've had my hair trimmed and it needs it. It is starting to look pretty ragged. Luckily I have a friend who cuts hair so I'm going to make an appointment with her this week. Goal #4: Return to training! My goal is to get at least 2-3 runs in this week! I have several half marathons coming up so I need to continue training. Goal #5: Get my Disney recap written and posted. I know you are all waiting for this! Sorry it's taking me so long! I've been waiting for all the race photos to be posted...I think they are all up now so this will be posted this week! So there I go! Goals are written so now it's time to conquer them!!! Don't forget to link your post up on Molly's blog!